This Date in History: When we hear of flooding on the Mississippi River, most people think of the recent big events in 1993 and 1997. They were huge for the plains states…record levels. But, in 1997, the lower Mississippi River was above flood stage for just 69 days. I say “just” because the Lower Mississippi has been flooding since time began. In 1927, the lower river had been above flood stage for a record 135 days and in 1983 for 115 in a row and third on the list is 99 days and that happened in 1973. That year the economy of the United States may have been forever altered and the landscape, culture and environment of Louisiana changed such that the Cajuns would have had something new to sing about, there may not have been as many sportsmen in “Sportsmen’s Paradise” and the maps would have had to be changed. 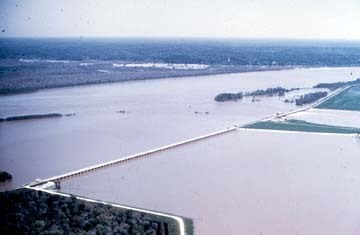 Well North of Louisiana, On this date in 1973, the Mississippi River at St. Louis rose above flood stage and stayed above flood stage for 77 days. No type-o there….77 days. It would not crest until April 28 at over 43 feet, a record that was topped by 6 feet in 1993. It was still many more weeks before it went below flood stage. There were numerous causes. First off, there was a whole bunch of rain in the autumn in the Mississippi sink…or the area that drains into the Mississippi. The area is huge, encompassing much of the Central and Northern plains and parts of the Midwest. So, there was a whole bunch of water that saturated the ground and elevated water levels in all of the tributaries of the Mississippi. 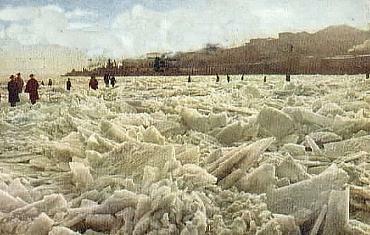 That winter it got very very cold and there was a tremendous amount of snow in the northern plains. 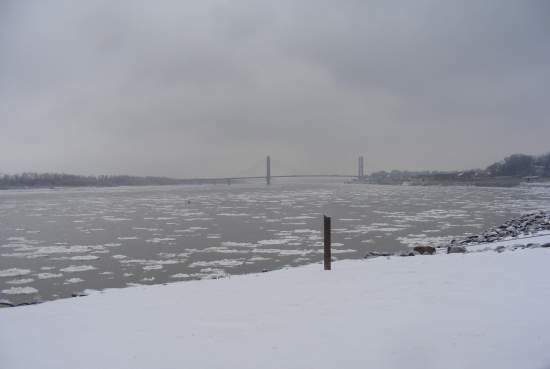 If I recall correctly, there were news reports of the Big Muddy being frozen from St. Louis northward which caused a big problem for the commodities transported up and down the river. The ice jam broke in the spring and so all of this ice and water from the fall and melting snow all moved at once. Between Baton Rouge, LA and Natchez MS there is a place called Simmesport, LA. at that point, the Mississippi breaks off, with part of the water going down the Atchafalaya River. The Atchafalaya has a complex history as it once, along with the Red River, flowed separate and parallel to the Mississippi. 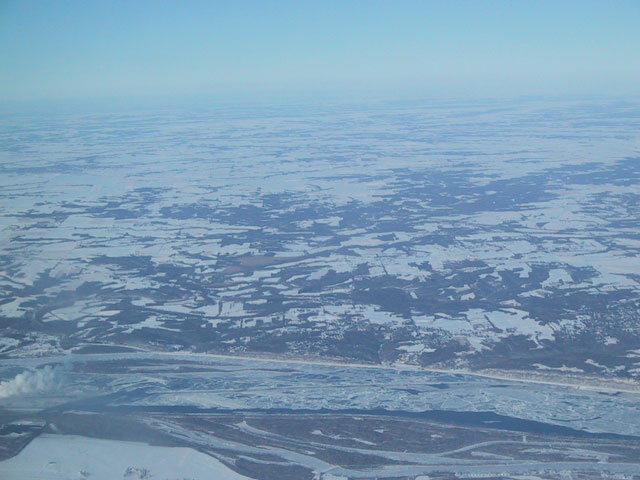 Over time, the Mississippi flowed abruptly to the west forming a horseshoe that merged with the Red River. Someone dug a canal to shorted Big Muddy’s route and all sorts of other changes took place to the point that the Red River now empties into the Mississippi and part of the old river channel connects with the Atchafalaya. From time to time, water will either flow into the Atchafalaya east to the Mississippi River or at times of high water on the Mighty Mississip, the flow might be the reverse. Near Simmesport in 1963, the US Army Corps of Engineers built the Louisiana Old River Control Structure because the old river channel is highly vulnerable to perhaps enticing the Mississippi River to change it’s course permanently and mainly flowing down the Atchafalaya . In 1973, it tried to do just that. Now, by law, the flood control boys can only release a maximum of 30% of the flow into the Atchafalaya but the river is not bound my man’s laws. The flood control project in 1973 could have used the old Pittsburgh Steelers Steel Curtain because the river was relentless with its offensive power. I was told by a Geologist in Natchez, MS that the Corps of Engineers at Simmesport had dumptrucks dumping huge boulders into crevaces around the structure for 24/7 during a particularly tough week. He said they came very very close to losing the entire dam as the water was scouring away the substructure from both sides. 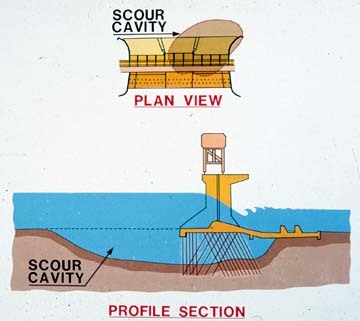 If it the scouring below the structure had become fully developed, then there is a fair chance that the structure would have failed, the Mississippi would have altered course and sent most of its water down the Atchafalaya. The topography around and leading into the Atchafalaya is such that there is a real risk that, after the flood, the river would not go back to its old route. This geologist opined that its not a matter of if the river takes its course, but when. He is not alone in that assessment. Had they lost that structure, the Mississippi River would now be flowing between Lafayette, LA and Baton Rouge but the ports of New Orleans and Baton Rouge w0uld not be ghost towns as the might river would not have left them totally high and dry. 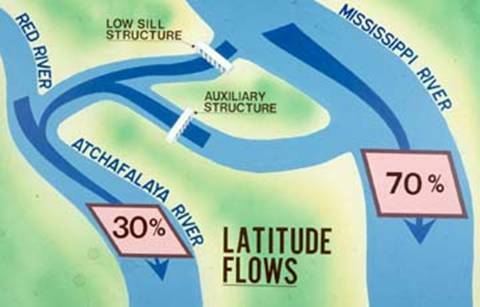 Instead, speculation is that instead of taking 70% of the flow, the current channel would only get 30% and the Atchafalaya would take the remaining 70%. Morgan City at the mouth of the Atchafalaya would have to be relocated, oyster beds would be destroyed and fisheries in the Gulf wiped out. 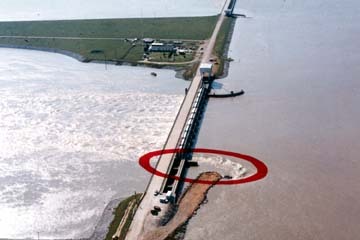 They might be able to more easily dredge the channel between the Gulf and New Orleans and on to Baton Rouge because there would be less sediment build up. But, New Orleans would have a huge problem because it would have to find a new source for water since the river’s flow would not be sufficient to prevent salt water intrusion from the Gulf. then there is the petroleum interests that would adversely affected as gas lines and oil pipelines crossing the Atchafalaya basin would be damaged or destroyed and oil service installations would probably suffer catestrophic damage. Then the roads…all those bridges….the rail road bridges. All crossing the Atchafalaya Basin would most likely be damaged beyond suitable utility. Again, if I recall, that 1972/73 winter was toward the end of a series of very very cold winters across the nation and the evening news and the papers were filled with stories about how we were heading back toward an ice age. Amazing how 30 years can change the headlines. But, more importantly, we know that the river will flood again. If the experts are correct, at some point in time, New Orleans will suffer a catastrophe and it won’t be from a Hurricane. This entry was posted on Wednesday, March 31st, 2010 at 11:55 pm and is filed under Bob Symon, Environment, History, Louisville Forecast, Louisville Weather, Opinion, Science, This Date In History, Weather and Weather and History. Tagged: 1973 Flood, Atchafalaya River, Frozen Mississippi River, Frozen Mississippi River photos, Hydrology, Mississippi Flood 1973, Mississippi River, Mississippi River Flood Control Simmeport LA, Mississippi River flooding, Old River Control Structure. You can feed this entry. You can leave a response, or trackback from your own site.